Report: South Korea Developing New Pop Group Capable Of Reaching U.S.
Once dismissed as saber-rattling, experts now say South Korea is nearly single-minded in its quest to reach the continental U.S. with wholesome, yet undeniably danceable, pop and hip-hop lite. WASHINGTON—Warning that a successful launch would constitute a grave threat to American population centers from coast to coast, leading analysts confirmed Wednesday that South Korea is currently developing a new pop group capable of reaching the United States. Experts stated that significant South Korean resources have been dedicated to the project of creating an intercontinental, all-girl supergroup, with a team of highly skilled producers, vocal coaches, and choreographers working in hidden rehearsal facilities to devise a strategic pop phenomenon that, if fully deployed, could inflict widespread devastation. Top-secret meetings were reportedly held this week after intelligence officials learned South Korea now possesses the drum machine technology necessary to synthesize a fully danceable breakbeat, a key step in the process of launching a tactical international debut single. Sound check footage obtained by the CIA suggests that the group has reached a far more advanced stage of development than previously thought and could mobilize for a world tour as soon as 2018. Speaking on condition of anonymity, a U.S. official told reporters that satellite imagery has revealed what appears to be an arena-sized stage set, with state-of-the-art recording studio complexes nearby. The official also said a Korean camera crew has been deployed to the same area, suggesting that a music video is in the works and that targeting the American charts may be within reach even sooner than feared. Long viewed as solely a regional threat, South Korea began conducting tests with smaller acts such as SG Wannabe and Brown Eyed Girls in the mid-2000s, and the limited range of those groups led most experts to consider the country’s ambitions for a transpacific R&B-inflected musical sensation to be completely unrealistic. “If the information we have is accurate, they are mere months away from having their first smash hit,” he added. According to sources, South Korean scientists were recently able to overcome long-standing problems controlling the highly unstable, potentially explosive chemistry between group members Q.U.E.E.N. Hyeung, Sunshine, Min-ji, DiA, and Stephanie. Officials in Seoul have reportedly discussed demonstrating their capabilities on state television with a 60-second promotional teaser from a music video that, were it to trend, would all but ensure total ruin on a continental scale. Federal officials have said the South Koreans still lack a vocal processor powerful enough to enrich SPLA$H’s tracks with sufficient levels of Auto-Tune. In an effort to stymie their progress, the U.S. government imposes heavy economic sanctions against the nation’s record industry, and it is believed to have conducted cyberattacks to corrupt files containing master tracks and lyrics. 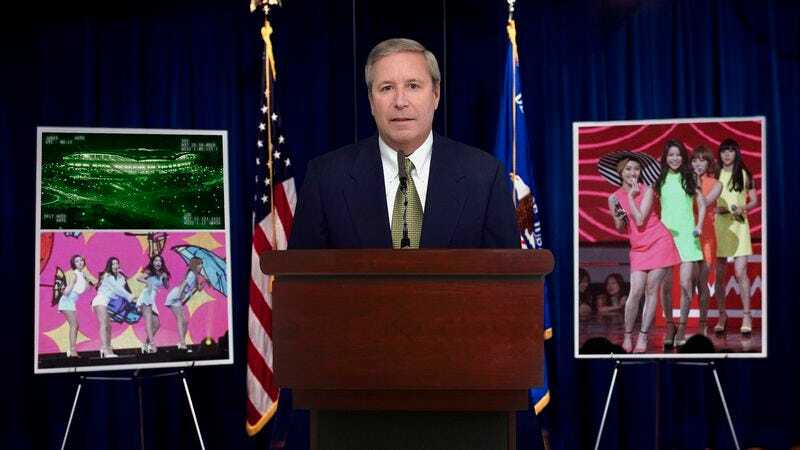 Highly placed sources confirmed officials have not ruled out the possibility of a preemptive attack before the teenage pop group’s first concert.